Going into our third year, our seasonal opener, hell of the north (plains) has gotten a healthy reconfiguration! It still features the signature Parson road climb and wildcat mountain connectors, but dives deep into some gamey new territory for the second half! Ever wanted to ride across highway 26 without ever even seeing it? Well now's your chance! hell of the north (plains) v3 is presented as a single route, which we highly encourage riding, however we have provided a couple of bailout options should you decide that adventure, bikeriding and having fun simply aren't your bag. This time around, we've found some really fun, wily new forest roads connecting the Timber/Strassel area with locales north of highway 26 via a veritable land bridge, crossing the highway over the top of the tunnel! From that point, we've got deep forest doubletrack, gamey climbs to the Bacona zone and some rough-and-tumble descending along the inimitable Sherman's Mill Road. Dairy Creek, Corey and Old Pumpkin Ridge Roads gently ferry us back to North Plains where we'll gather for adult beverages, snacks and post-ride merriment at the Rogue Pub and Eatery! * Having pre-ridden the course this past weekend, we have a couple of notes about this year's route. - The Hoffman Climb at mile 35: Also known as the HOFFERHORN or the HOFFBERG, is a gnarly 2 mile beastmaster of a hill, not necessarily by the numbers, as it is only averages between 8-10%, but has been resurfaced in a thick sloggy nightmare-paste of sandy peanut-butter-chunk slurry which makes the climb at least 1.7 times as dreadful. Good times? Only the best. - Sherman's Mill Road: We have been fortunate enough to have granted passage through the private property along Sherman's Mill Road on Saturday. It is a relatively short section from mile 43.7 to the gate at mile 44.7. Please be respectful of this property, as of course you would with all the property through which we pass, but understand that this is a rare favor, so please treat it that way. There are also sections along Sherman's Mill which are extremely steep and surfaced with chunky rock. Keep your wits about you on this one. - Upper Wildcat Mountain logging: There has been a recent uptick in active logging along the upper Wildcat Mountain descent. Emerging from the forested Wildcat connector at mile 20, the first few miles of the descent have seen very recent logging. Expect debris, sticks, branches and muddier, sloshier conditions than usual. - Minimum tire size is 38c. Trust us. We know the terrain! - This is a 99% open course on public roads, open to cars and automobile traffic. Riders agree to RIDE AT THEIR OWN RISK. You and ONLY you will be responsible for navigating hazards as they relate to traffic, roads, general safety and weather conditions. Riders are absolutely under their own responsibility to ride, navigate and conduct themselves safely and appropriate to conditions as they exist in the field. We are and have always been just a nice group of friends out for a bike ride. - Riders understand that as a condition of participation..ie..'showing up' (which includes use of any provided GPS data), riders agree to assume all risks and agree to release and hold harmless everyone associated with this ride, including any organizers, volunteers or sponsors. ** A bit about the aforementioned bailout options. If something goes sideways early on, your pedal falls off, you're not having any fun and your friends have dropped you and you're out of whiskey already, there is a simple bailout at mile 19 at the intersection of Hayward Road and the Wildcat Mountain connector gate. Hayward leads directly to highway 26, the Banks/Vernonia Trail is just on the other side. There is also a second bailout at mile 35 where Nowakowski Road crosses the Banks/Vernonia. * The version below shows Hell of the North Plains V3 w/ the Banks/Vernonia trail bailout at Nowakowski Road. 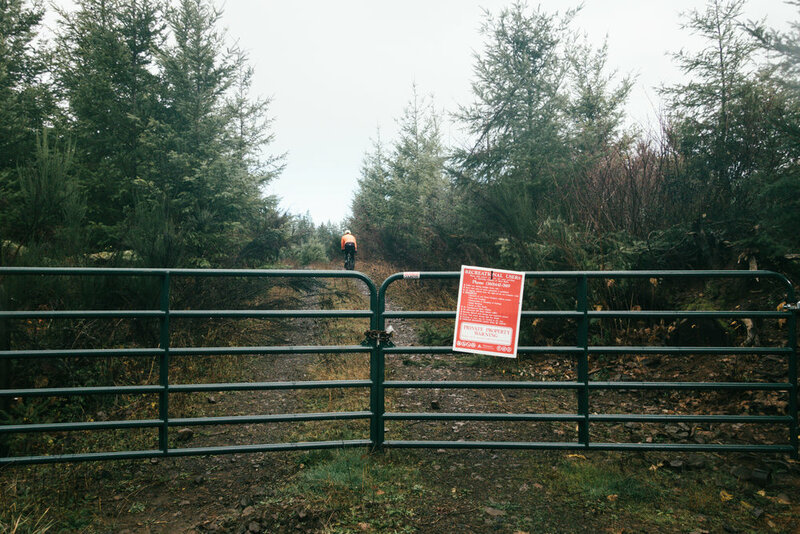 While we highly encourage riding the primary route, we understand that conditions are likely to be wet, cold and the Hoffman climb is going to be a ruff-puff, so the route shown below has an escape hatch at mile 35.